PERI industrial scaffolding helps EPC contractors, scaffolding contractors and plant owners manage their access requirements more effectively by providing the most innovative products and programs thus increasing safety and productivity drastically. The core of it all is the PERI Integrated Scaffold Program. Our made in Germany Scaffolding System goes through the toughest quality assurance and quality control standards, thus making increased safety a more predictable factor. Further, PERI provides detailed scaffolding target estimates based on actual design. 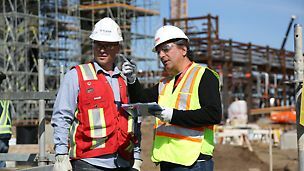 The target estimate will detail the scaffold requirements (i.e. equipment, labor, and cost) by work package and work area. All options are explored in advance. 3D modelling enables the visualization in advance. This increases cost certainty and predictability and also facilitates the quantification of scaffold material. The added value of design and planning drives a reduction in equipment required. 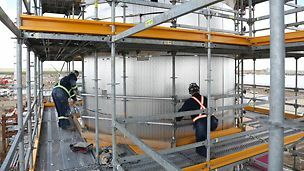 This also translates to fewer craft hours expended, as scaffolding will not be taken down and erected over and over for different contractors with different requirements. Software supported monitoring provides accurate crew performance metrics that aid in supervision and cost forecasting. 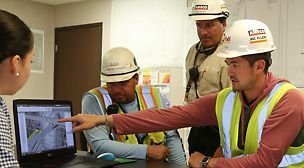 Actual crew performance against estimated work hours can be reviewed to take corrective actions long before significant budget overruns occur. While PERI as a manufacturer does not self-perform any labor, we have strong training partners to ensure self performed scaffolding yields the best results. Our cooperation with dedicated subcontractors that are exclusively specialized in using PERI material ensures the most efficient operations. 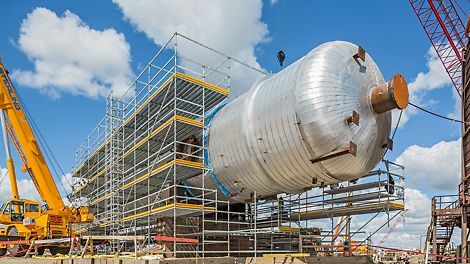 We are in direct contact with plant owners, EPC companies and scaffolding subcontractors to ensure our products are used in the most efficient, effective and safe manner.